China Glaze Sweet Hook with Kiko 618 Orchid Pink, 620 Lavender, 621 Violet and Konad plate m69. The brush I used to fix some lines came from a set of brushes (and one small dotting tool) which BornPrettyStore send me for review. I think this set offers a great variety in brushes, flat, angled, pointy, fan, long, you name it. All brushes except the fan brushes have protective plastic on the top, which comes off easily and can be reapplied. 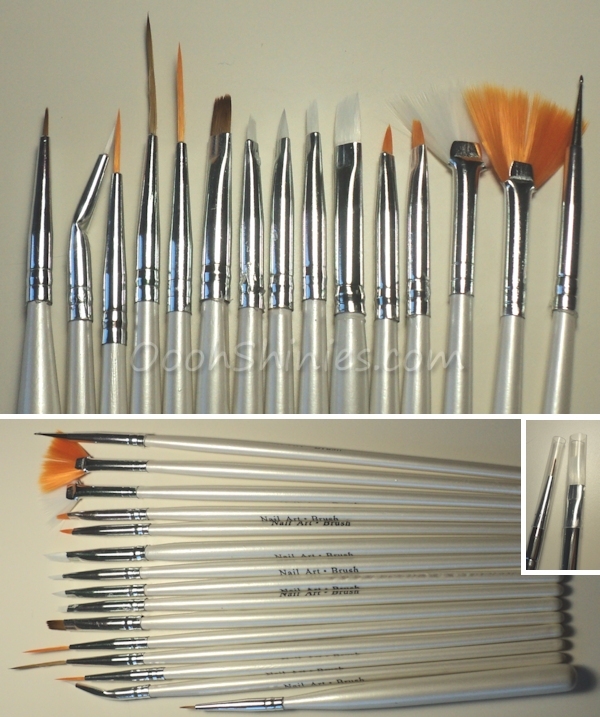 I think it's a nice set, and if you're not used to brushes (like me) and would like to try different ones, this set offers you plenty of choice. You can buy this set at BornPrettyStore for $5,96 and contains 15 pieces, with coupon code ABJ61 you'll get another 10% off.